Mobaxterm is a set of network tools included in a single portable exe file. 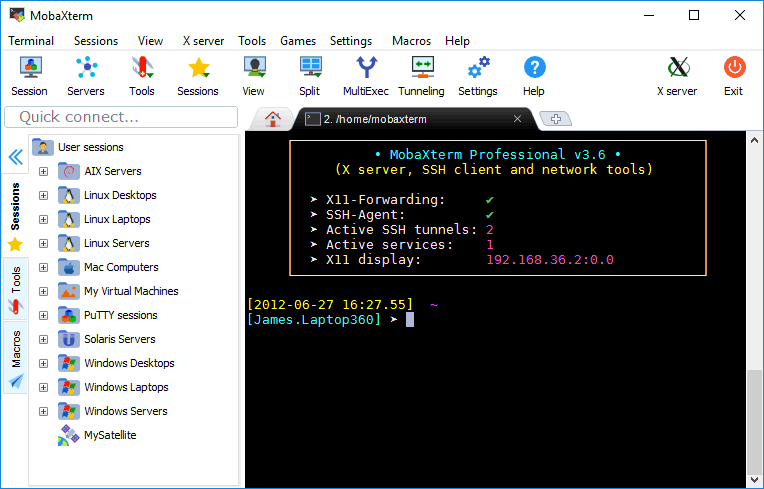 Mobaxterm integrates an x server and many network clients (ssh, rdp, vnc, telnet, rlogin, sftp, ftp, and more) accessible through a tab-based terminal. MobaXterm is an utility that works under windows xp, windows vista and windows 7. It supports both 32-bit & 64-bit windows editions, therefore it could run faster on 64-bit computers. It is Free so you can download it and share it with your friends. Estimated download time for MobaXterm on a common adsl connection is less than a minute. Version 11.1 was released ninety five days ago by Mobatek. Click the green download button to download it now.